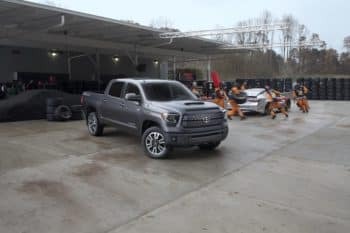 In your full-sized life, you need a full-size truck that can handle everything you have to throw at it—and that truck may be the Toyota Tundra. With rugged elegance and subtle strength, this truck will not only turn heads, but it’ll also do everything you need it to do in the Avon, Indianapolis, and Plainfield areas. Don’t take our word for it, though. Come down to Andy Mohr Toyota and see the Tundra in person. Take it on a test drive to see what it can do. After all, until you’re behind the wheel of this truck, you’ll never know how you feel about it. Get behind the wheel and truly experience what this truck has to offer. 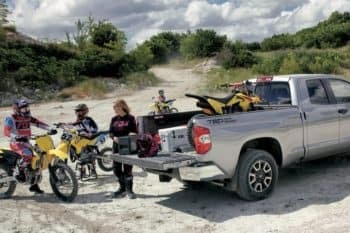 Whether your truck is going to be your rolling man cave or if you’re planning on making it the new family vehicle, there are plenty of configurations from which you can select your favorite model. With several different trim level variations, finding the right truck for your needs will be as close to customization as you can get. From a double cab to a crew cab, 4×2 or 4×4, or a 5.5-foot bed or 6.5-foot bed, we have several different Tundra build options here on our lot. Whether you’re looking for something basic or if you want something decked out with all the options you could imagine, you’ll find it in this truck. 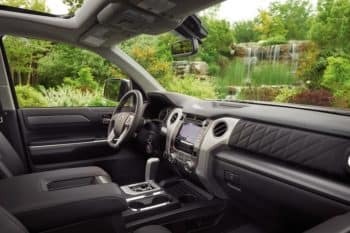 The entry-level model of the Tundra, the SR, offers plenty of great options, such as Toyota Safety Sense™ P.
With the special 1794 Edition, you’ll have perforated leather seats that offer both heating and ventilation, thus ensuring your comfort through the range of seasons, along with everything that comes standard in the SR. However, if you want the best of the best, you have to go with the Platinum. Get the sliding rear window with privacy glass and the premium sound system. No matter which Tundra experience you want, we’ve got them all. When you’re looking at a new truck, you’re probably excited about the new technology and the next greatest safety features. Do you love that feeling; the feeling of having a new vehicle? There’s a financing option to keep that feeling all that time and that’s a vehicle lease deal. With one of our lease specials, you get a Tundra for three years and as long as you keep within the mileage limit and you return the truck in good condition, you get to renew your lease and drive away in a brand-new truck. If a new vehicle every three years sounds like a great plan to you, then fill out our online financing application and see what leasing is all about. Like we said, you’ll never know if you like it until you try it but be prepared to fall in love with the Toyota Tundra. With the addition of standard Toyota Safety Sense™ P to every vehicle and the best tech going into the upper trim levels, this truck is changing the game for drivers in the Indianapolis, Avon, and Plainfield areas. Come see what it has to offer at Andy Mohr Toyota!